Conclusion – Fukushima had explosions from WITHIN the reactor vessel and/or fuel pool, launching in a Cannon type fashion, TONS of Uranium and Plutonium into the atmosphere. Can it all be diverted to Crawford Texas??? Not unless you say "Mission Accomplished" first! Nuclear power; maybe. "Nucular" power; NO!!! Anonymous and TechDud guess what. Its in you right now and nothing you can do about it. Tepco - mission accomplished. Inside ALL OF US NOW!!!! Agenda 21! I don't get it. The charts are showing pCi/m3, activity per unit volume. How did you deduce a weight, tons from this data ? Go to the yellow highlighted link above "Exhibits and Tables for Uranium in Air"
I have a burning bladder and burning areas on the soles of my feet. Is this indicative of anything?? I have been in the Pacific Ocean just this summer and past 2 summers. West Coast on Vancouver Island. What about the plutonium? It doesn't take very much at all when aerosolized in to the atmosphere to doom pretty much all of us to an early miserable death! Roughly 7% was plutonium if it was the reactor that blew, only 1% if it was only the spent pool. Please explain how the reactor could blow up and leave the roof framework above it intact. show me a blueprint of the layout of the reactor building. There is a huge hole in the roof just to the "left" of center, and the whole nuetron'd roof fell over towards the left, The roof is not square on the building were it started. It could also have been the fuel pool that went nuclear, but I think not. show evidence with your comments, not just quick jabs. Use jing, provide data. Same way the steel frame of a building remained standing directly underneath the Hiroshima bomb, which was a thousand times more powerful. Japanese nuclear-reactor designer Setsuo Fujiwara: "... the Reactor 3 building was bent like candy..."
The bending is from heat. Steel beams present a narrow cross-section to the blast. They didn't absorb enough energy to shatter them. When people start to REALLY get sick, with low-level radiation poisoning (which is often more deadly than large, single dose radiation); then people will WAKE UP - but then, it will be TOO LATE! Fear is rational behavior. Pessimism is illogical behavior. My two cents. Your calculations are what we call in the business as pessimistic. Irony. Red pill. Take it. please address the pyrophoric burn that happened after explosions. photo proof of it. I think a 2600cpm in Honolulu says all that needs to be said. Comparable to Fukushima as predicted years ago. Also predicted was that the West Coast of US would be worse than Fukushima and that may well be the case. In plain English, this should be an evacuation scenario but how do you evacuate hundreds of millions? You don't. Stock, I am trying to explain to someone that reactors at Daiichi were NOT just hydrogen explosion but nuclear fission - but not sure after reading articles what would be the definitive way to describe this. 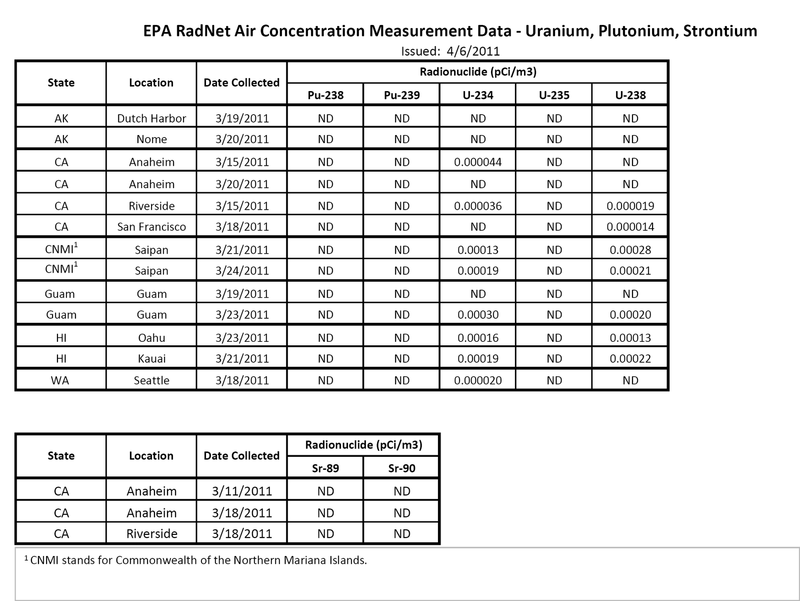 Do the uranium and plutonium measured in this data have a fukushima signature? 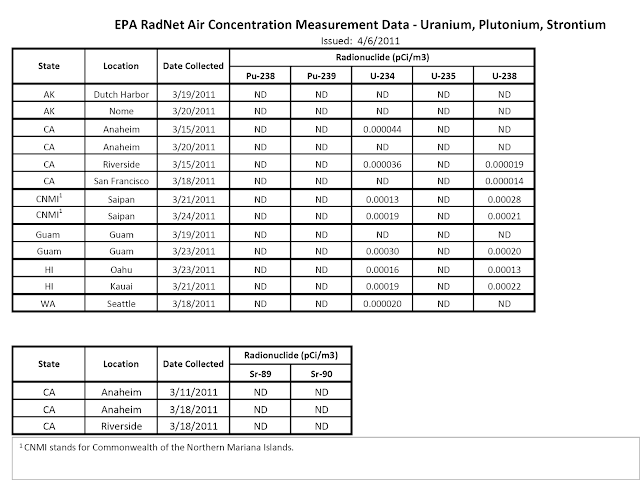 Per the above, the measured uranium in air was 2600% the normal background in Honolulu, therefore no signature is required, its obvious spike after the explosions. My article that strikes to the heart that is was a nuclear explosion is here. Thank you so much stock. My father is visiting, and he proudly handed me a book on fukushima written by this journalist - yoichi funabashi - he was on 60 minutes last night. I scanned through the book and it seems to assume ( as do my parents ) there was no nuclear explosion. I am going to try one last time while he is here, to explain. This is very helpful. Bo, it is very simple. How could all that uranium and plutonium get into the air, unless the explosion came from within and below to launch the SF out of the pool or reactor. A hydrogen explosion would compress it down. Error analysis? Oh right, not necessary when using models retrieved from own behind. Stock, I'm in the middle of a discssion with somebody ( not a troll, lol ) who thinks reactors at fukushima had just hydrogen explosions, not nuclear fission. Looking for that ultimate evidence that they were indeed nuclear explosion - does the plutonium and uranium in this data come with a fukushima signature? I am a pessimist. I used to be an optimist until I kept on making the wrong decisions. Maybe I'm just stupid but at least being a pessimist keeps me from trusting anyone but myself. I have no doubt that Fukushima is the biggest in a long, long list of nuclear accidents, controlled toxic releases from NPP's, nuclear bomb tests, and (not really depleted) Uranium weapons use in foreign entanglements. Am I supposed to feel chosen because I'm not sick? No I don't. I just worry about when I will because of these environmental pollutants. But I'm also a smoker who feels too stressed to give-up. So if I die prematurely smoking will, of course, be considered the culprit. So my example shows that we, imperfect beings, cannot stand up to the onslaught of the perfect machine/system as the machine will point to your own failings, not theirs as the reason for your demise. Not that it necessarily is, but we are conditioned to think this is so. Which maybe is the real perfection of the machine/system. The mouthpieces of the elite (when they used to bother to talk to me) would have the mantra that the system is always right. Even when it's wrong. It is for these reasons and more that I'm a pessimist. Sorry 'bout that. Aphorisms wont apply such as Stock's motto about pessimism being illogical. I don't see the illogicality in saying it is already too late. I think it is as well. That doesn't mean that you give up fighting acceptance of it because there maybe a miracle about to happen. Except I don't believe in them either. I'll stop being a pessimist when the smart guys stop thinking they are right. I live on the west coast and this frightens me, but in no way am I surprised. I suppose I am just supposed to read about it and not be able to do anything about it. There may be a link between aerosolized Uranium and skin cancer. we have let and most likely will continue to let big brother do as he pleases,We the people of this good earth,are indeed in trouble. And still our leaders lie steal kill and keep secret one of the most important communications we as humans have ,TRUST,TRUTH, this will never go away.We are not .but we are becoming sheep.Everything put into law is about control of us the people. Why? because we do what and believe what we are told period, We talk ,and talk we see and in are hearts know , but do little or nothing. to help man kind .has become a jail sentence, to take all the money familys have saved for old age gold and sacks, what a joke right in our faces. I bet there still laughing at us dumb asses we do nothing,nothing and with all the world laughing at the united states of America ,our president the person in charge the one person we the people put our faith our lives our world our family in trusted with.. Is in fact not trust worthy at all. We don't know what he is, he dosent have to prove anything .just ask him.we are doomed,Every american that has giving his all his sons fathers for the united states go to arlinton tell then we lied we don't care,we do but for money .How much is to much? Just a little more. J.P.G im done ,You may say that I dident go to school, but brother ..I feel better. the TRUTH. Do people realise that Fukushima is owned by the Rothschild's. Link? I'm trailing the money and so far a lot leads to the Rothschilds. ...does it ever get to you? FF which do you mean? The lies of the cartel, the disrespect for all life, the greed, the radiation, the heavy metals.....yes I guess it all gets to you? Since 3/11 I have had to undergo an ulnar nerve juxtoposition surgery due to a fiberous growth on my ulnar nerve. Not long after that malady, I had to undergo a very extensive sinus surgery due to a chronic infection which returnend less than a week after surgery. As of 3 weeks ago, a lesion which changes colors daily, appeared on my forehead and has not since healed. The doctor who preformed my sinus surgery, informed me that although he found no single polyp in my sinuses, the lining of all my sinus cavities was badly polypinated. My girlfriend, since 3/11 has developed periodic diahiarea, which sometimes lasts for weeks, stops for various leangths of time, '' up to a week at most '' and then returns. About a month ago while she was sitting on the couch watching telivision, her left arm suddenly began to violently itch and although she refrained from scratching strange reddish streaks up to 4 inches long app[eared just beneath the surface of her skin. The streaks and the itching lasted about 30 minutes and then subsided. An hour latter the streaks were no longer visible. Interestingly enough, our cat which was 5 years old when the meltdowns occoured suddenly gained about 8 pounds, '' only a month following the meltdowns '' and then dissapered not to be seen again. Our dog whom is 6 years old is loosing his fir and has a large lesion of some sort on his head. We have also experienced the sudden death of some of our trees, trees which were healthy prior to 3/11 and we now have many plants which bloom at the wrong time of year. One of our Magnolias actually bloomed in August and then again for a week in September of this year. Of course I have no proof that the fall out from Fukishima is the cause, or is even related to any of this, but deep down inside I know, and there is nothing I or any one can do about it. I can only wonder, and to be honest, dread what is to come in the next 5 to 10 years, that is if I even have that long. Have you ever had a sundae with broken cookie or candy pieces in it? Waste from one factory becomes the raw material for another. Toxic waste is expensive to dispose of but if it is used in another product, it becomes a raw material and is thus re-categorized as something other than waste. When used in a proprietary formula (Coke or KFC) trade secrets can be invoked thereby hiding the true nature of the ingredients. Flouridated water, cigarettes, lead in gas and paint, and fillers in Chinese pet food are all examples of this practice. Do you think that the persistent contrails witnessed while cloud-seeding (etc) contain these sorts of re-purposed waste materials? yes, I do believe the the chemtrails are using stuff that they would otherwise have to pay big money to "process and dispose"